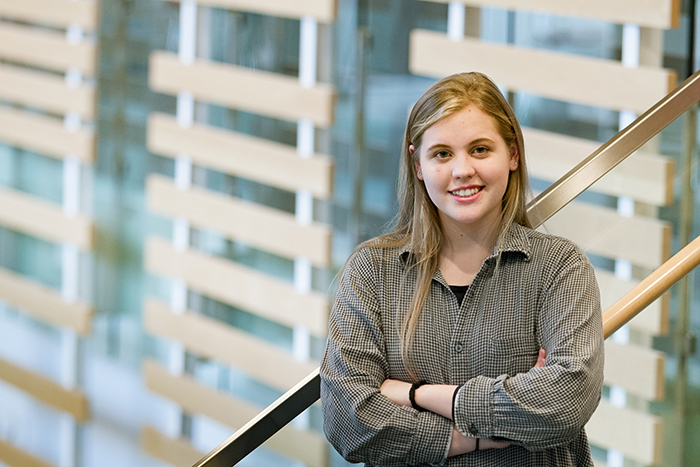 Sophie Kivlehan '21 is a plaintiff in a federal lawsuit aiming to change the U.S. government's environmental policy. Speaking at a press conference at the Conference of the Parties (COP) 23 summit in Bonn, Germany, Sophie Kivlehan ’21 got straight to the point: The adult generation has squandered the earth’s natural resources, she said, and unless we course-correct immediately, her generation will pay a devastating price. With guidance from her grandfather, a world-famous scientist-activist, Kivlehan is taking action, along with 20 other young people from across the U.S. who are plaintiffs in a lawsuit against the U.S. government for promoting fossil fuels despite evidence of damaging effects to the environment. During her first semester at Dickinson, Kivlehan discussed the lawsuit and her next steps to help build a more sustainable future. As the granddaughter of 2013-14 Priestley Award winner James Hansen, the former director of NASA’s Goddard Institute for Space Studies and the director of the Climate Science, Awareness and Solutions programs at Columbia University, Kivlehan has interwoven climate science into some of her earliest family memories. Six years older than her next-in-line sibling, Connor, and their young cousins, she often lingered at the dinner table during family gatherings. While the younger children played in the next room, she listened in on adult conversations about science and current events, and she developed a fascination for the sciences. Seeing this, her grandfather cooked up some simple science experiments the two of them could try together, along with Connor (Kivlehan once even wrote to President Obama about her findings). She says she discovered that not all children grew up in such an environmentally conscious environment during an elementary-school lesson about solar energy. “I didn’t know all of the details, but I knew there was a problem, and it shocked me that a lot of adults didn’t seem to be aware of the issue,” she says. “We were talking about how the sun provides energy and we stopped there, and I thought, ‘We’re just getting to the important stuff.’ "
When Kivlehan was 15 or 16, Hansen sat her down to explain the nuts and bolts of environmental science, and, she recalls, he was surprised to discover that she already had it down. When he told her about the upcoming lawsuit, she enthusiastically signed up. Juliana v. United States was filed by the nonprofit Our Children’s Trust in 2015, when its plaintiffs ranged from age 8 to 19 (it’s named after the oldest among them, Kelsey Juliana). Two years later, it challenges a new administration, including the Environmental Protection Agency, the Office of the President and President Trump. Hansen is the expert advisor for the suit. The lawsuit’s aim is to compel the government to develop and carry out a more aggressive plan to reduce fossil-fuel emissions—one that reduces emissions at a rate that aligns with the recommendations of the climate-science community. “We want the government to realize that young people notice that they’re not doing their jobs, and we’re not going to be quiet about it,” says Kivlehan. The lawsuit was filed in August 2015, on National Youth Day. The following March, Kivlehan and fellow plaintiffs attended the pretrial, seen by a magisterial judge. Each had written about the effects of global warming they've witnessed. Kivlehan pointed to recent weather extremes in her hometown in Allentown, Pennsylvania. Another plaintiff described what it’s like to live in coastal Louisiana in the wake of devastating storms, and another noted the progressively struggling orchard on his generations-old family farm. The plaintiffs contend that climate change threatens their future and that by taking actions that exacerbate the problem, such as leasing the Gulf of Mexico for oil exploration and development, and by failing to protect essential public trust-resources like water and air, the government has violated their constitutional rights to life, liberty, and property—the property, in this case, being clean natural resources. The judge ruled that the case was solid, and an appeal followed, with the same result. A Ninth Circuit hearing began Dec. 11, and a trial date has been penciled in. Kivlehan is happily adjusting to her first semester at Dickinson, a college she chose in part because of its commitment to sustainability. She’s enjoying a first-year seminar on climate change (“I’ve learned new ways to explain climate science to others”) and meeting like-minded students and professors. She plans a career in medicine. And while finals kept her from traveling to the current hearing, she’s keeping her eye on the lawsuit ball. Kivlehan says nothing will keep her from the upcoming trial, tentatively set for Feb. 5.